In the time of Coachellapalooza-commissioned band reunions, derision, detraction, reduction, accusation, and speculation looms heavy over the actualization of any band reboot or reunion – especially those with cult followings. But if the current band Trent Reznor is bussing around the world as Nine Inch Nails has been feeling the pressure, you will not have guessed it – especially upon witnessing the Toronto stop of its Tension 2013 tour. When Reznor announced in February of this year that the band was “reinventing itself from scratch,” it was with a recipe that enlisted ingredients long claiming presence in NIN’s stew. Reznor had collected intermittent guest contributor and King Crimson frontman Adrian Belew, Year Zero/Ghosts I-IV/The Slip-era NIN multi-instrumentalist Alessandro Cortini, Things Falling Apart contributor Josh Eustis, and Ilan Rubin, who toured with NIN in 2009 for its Wave Goodbye touring drummer – all contributors to NIN’s Aug. 30-released Hesitation Marks. The one exception was bassist Eric Avery (Garbage, Jane’s Addiction), who before NIN’s 2013 touring would kick off, departed from the band in May. Quick to fill the void in the lineup, Reznor summoned guitarist Robin Finck, a longtime pillar of NIN since the band required a touring member in 1994. With the re-addition of Finck, Eustis took on the principal bass duties Avery relinquished, but when Belew echoed Avery’s move and quit the band in June, Reznor was left short a guitarist for the band’s 2013 festival, and a dynamic one at that. While festival audiences (and the amateur audio and video bootlegs that followed) gave listeners a dose of the new NIN, when the band exited the festival circuit in September with a fresh album to promote on the Tension 2013 tour, Reznor revealed Hesitation Marks bassist Pino Palladino amongst the band’s lineup, and with him a personnel closer to what he had initially intended. At the Toronto stop of Tension 2013, Reznor used that new, once again shuffled army to breathe as much life into the new album as could be considered respectful in a city that would perhaps rather approach the show as a reunion instead of a commercial endeavour. Opening with Hesitation Marks single “Copy of A,” Reznor framed a performance that – although still acknowledging fan favourites through “Head Like A Hole,” “Terrible Lie,” and concert closer “Hurt” – would favour the new album as well as The Fragile (with nine and five tracks from each, respectively), recognizably withholding numbers from earlier albums like Pretty Machine and The Downward Spiral (full setlist below). Can’t imagine getting bored in that audience, can you? Even if the instrumental juggling failed to engage you, Reznor and co. brought in tow one of the most engaging light shows the Air Canada Centre has ever seen. Once the band had closed out “All Time Low,” “Dissappointed” a series of stage-long LED fences lowered onto the stage, fencing the band off from the crowd. At first they featured dancing lines of light moving from side-to-side, but eventually, as if to illustrate the boundaried freedoms that are the subject of the song they accompanied, created the illusion of a three-dimensional box prowling around the band it surrounded. During “Terrible Lie,” the band lined up Kraftwerk-style as each bandmate stood in front of their own narrower light walls and their shadows projected over screens of blindingly white cyberpunk static. Although the light show was newer than ones of old (and impressive to say the least), it wasn’t entirely unexpected, especially for those that caught the band live in the more recent years before their circa-2009 hiatus. Perhaps more surprising and mind-blowing were the standout soul backing vocals provided by singers Sharlotte Gibson and Rolling Stones touring backing vocalist Lisa Fischer, a move that offered fans exhilarating new ways to experience songs both new and old, from songs positioned as early on in the set as “The Wretched,” all the way through “While I’m Still Here.” A personal favourite of their vocal performances was on Hesitation Marks cut “Various Methods of Escape.” Find yourself a recording of that on the Internet. Do it. In sum, it was a fantastic opportunity to catch a renewed Nine Inch Nails performing both new and old material in entirely new ways. And while it is true that the band held back mercilessly on performing its earlier material, let’s not forget that a certain Downward Spiral reaches its 20-year-anniversary next February. 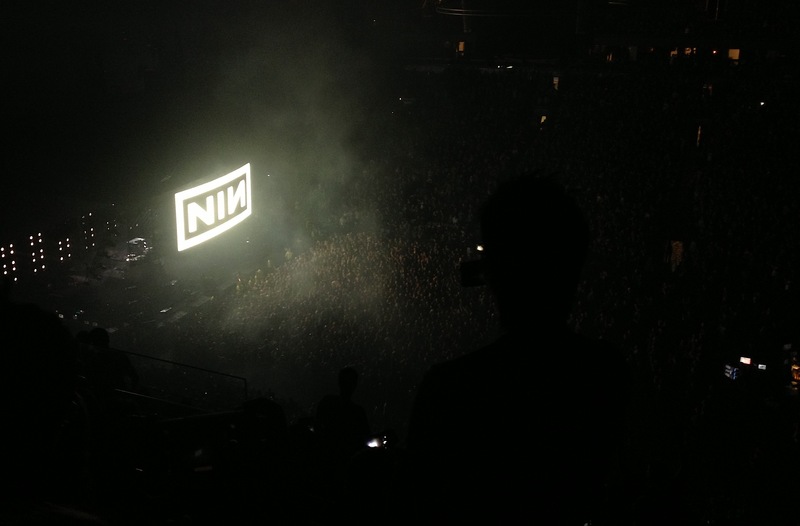 If NIN were to cash in on that occasion with the lineup and the risk taking it brought to the Air Canada Centre on Oct. 4, I wouldn’t just forgive them; I’d say bring it on. This entry was posted in Burden of Salt and tagged Air Canada Centre, Hesitation Marks, NIN, Nine Inch Nails, reunion, setlist, Tension 2013, Toronto, Trent Reznor on October 11, 2013 by Tom Beedham.